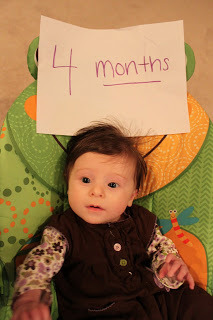 My little girl is 4 months!! Can you tell she’s more active? 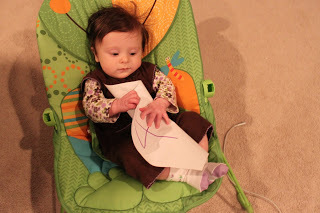 She crinkled the paper up! Better late than never to post this! My little girl turned 4 months last Wednesday. Oh my goodness she is growing and changing. She is doing really well with her solid food. She LOVES sweet potatoes. She tried blueberries tonight and liked them at first but then decided all the sudden that she didn’t like them. So Kyle gave her some of my leftover vanilla yogurt and she loved that a lot. It’s so fun. Abigail is playing more. She rediscovered her play gym because I didn’t put her on it for almost a week but I did yesterday. She played for over an hour by herself on it by hitting the toys, grabbing them, talking, and rolling over. So cute! Last night we had her babysat by someone other than my parents, Tiree and Jimmy, and it apparently didn’t go the greatest. Tiree was so gracious and made it through Abigail’s screaming for her mommy. I felt so bad. It was only a couple hours or so but she is a momma’s girl! I realized something about myself. I realized that I am more attached to my girl than I knew. All night last night I wanted to cuddle with her cause I missed her but she was sleeping. This morning I had MOPS and told them to get me if she got upset cause I was concerned. I missed her! Can you tell I am with my girl 24/7 and she doesn’t get babysat??? haha. Bottom line, I am so blessed and grateful for my girl. I fall in love with her more everyday just like the Father and my husband. I thank God for her and my wonderful husband each day.